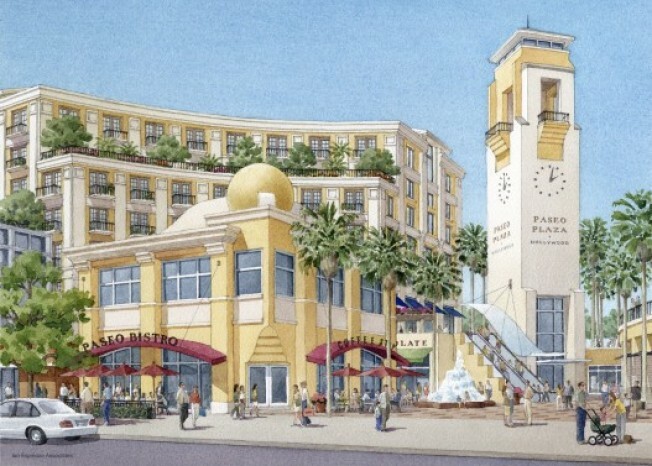 Planned for a block west of Santa Monica and Western, the sprawling mixed-used project Paseo Plaza is supposed to transform East Hollywood with its 437 residential units and 377,900 square feet of commercial space. Even the mayor's office has supported the project, calling it a "catalytic mixed-use development in East Hollywood" and noting that the project would create 500 new jobs. A bulldozer was spotted back on the site in February, and developer Continental Management was supposed to break ground in third quarter 2008. Now we hear that financial difficulties are behind the delays in the project. Is it going forward? A partner at project architect Gruen Associates tells us that the developers' financial hurdles have been sorted out and ground-breaking will happen in spring 2009. Colorful catalyst for change coming soon.